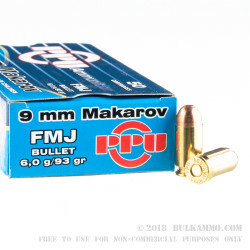 This is a 9mmx18mm load that is made with a 93 grain projectile and a Boxer primed brass case, which is a material not normally seen with the 9mm Makarov on the open market. Typically, those rounds are made with steel cartridge casings and a Berdan primer. 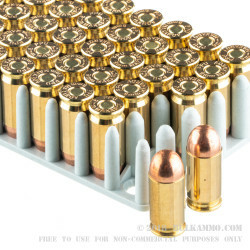 The steel cased ammunition shoots fine, but this ammunition can provide additional benefits to the shooting of these firearms, with increased feeding reliability and better extraction compared to the steel cased variety. This load is a substantial load and it can recoil slightly more than the military surplus 9x18mm, but the powder is much cleaner. It also has a larger muzzle blast, and does not have a corrosive primer or powder load compared to the surplus ammunition. 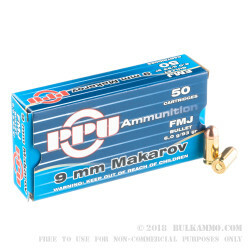 This 9x18mm ammo is also known as the 9mm Makarov and is a special cartridge only used in the Makarov weapons and a few others. It should not be confused with the 9x17mm cartridge which is known as the .380 Auto or .380 ACP which is also known by the name: 9mm Kurtz/Short. Similarly, it should not be confused with the 9x19mm which is also known as the 9mm Luger, 9mm Parabellum and 9mm NATO.